The integration of solar facade solutions into the HVAC and lighting system of a building can only be successful if it is coordinated with architects and building engineers. A good forum to get in touch with architecture professionals is the annual Advanced Building Skins Conference (ABS) in Switzerland. 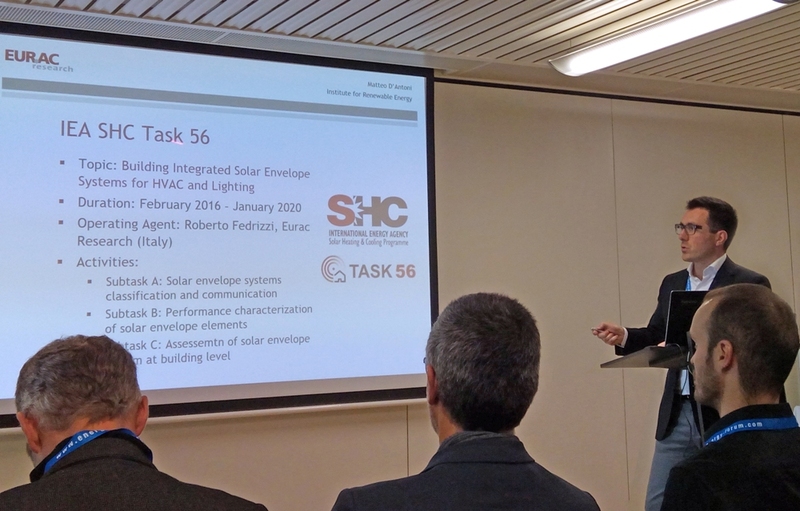 The 2016 edition, which took place from 11 to 13 October, also included a session by the researchers of Building Integrated Solar Envelope Systems for HVAC and Lighting, which is the name of Task 56 of the IEA Solar Heating and Cooling Programme. Swiss Advanced Building Skins, the organiser of the event, reported that 520 experts attended this year’s global forum to listen to presentations during six parallel session blocks. One of the sessions in block D was entitled Facade Integrated HVAC Components, during which five Task 56 members from Austria, Denmark and Italy held a presentation each. The session had been devised by D'Antoni Matteo, Senior Researcher at Eurac Research, Bolzano, Italy. “We had around 60 people in our session and interesting feedback from market players about what they expect from active solar facade elements,” Matteo said. His colleague, Roberto Fedrizzi, heads Task 56 and is the coordinator of the Sustainable Heating and Cooling Systems research group at Eurac Research. Fabian Ochs, Scientific Assistant at the University of Innsbruck, described the experiences made with the implementation of three differing prefabricated timber-frame facade and roof kits for retrofitting existing building stock financed within the European Community's Seventh Framework Programme. The kits include either a mechanical ventilation unit with heat recovery or pipes for water, sewage and electricity – or as a third variant, a large solar thermal collector. The three kits were field-tested at a multi-family building in Austria (see the picture above). “The retrofit process on site took seven weeks, from the first demolition tasks to the removal of the scaffolding. The complexity of the planning process and site coordination posed a challenge for all parties involved,” Ochs said. Overall, however, the results proved satisfactory. The retrofitted building meets the nearly zero energy aim by showing a primary energy demand of below 50 kWh/m²a for heating, domestic hot water preparation, lighting and auxiliary consumers. Matteo from Eurac Research presented the pre-study of a retrofitted adsorption solar collector module, which had been integrated into a curtain-wall facade to provide either air space heating or cooling. 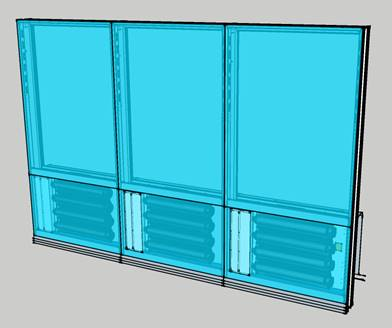 The integration of this system into facade modules will remove the need for a centralised ventilation system and a fan coil and allow solar radiation to be harvested for renewable energy production. The results from the simulation showed that a combination of active and passive cooling could decrease the use of a cooling coil considerably despite greatly varying performance based on the orientation of the facade and changes in ambient temperature. 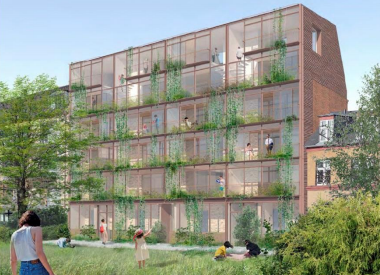 There is also the simulation of a renovated multi-family building originally constructed around 1900 in Copenhagen’s Valby quarter. The building is said to receive new flats on top as well as an approximately two-metre extension on the backside of the building. During the summer the extension should be used as an outside garden and in winter it becomes a heated indoor area. Danish Cenergia Energy Consultants is planning to add a window structure by domestic window supplier Velfac. The structure will have the advantage of greatly increasing the daylight quality of the living space without compromising its comfort and energy utilisation. The consultancy also intends to install building-integrated PV solutions to secure the overall CO2-neutral design of the renovation project. Task 56, which is in its first year, will run until January 2020. “We would like to identify the gaps in standards and certification as well as in guidelines on solar envelope solutions,” Fedrizzi from Eurac explained two of the main objectives. The team of Task 56 would also like to link their research efforts with private-sector initiatives and aims at increasing industry involvement in task activities. This year’s two meetings were joined by seven and five companies, respectively.